An allergy is an abnormal immune response to environmental agents called allergens. Pollen, animal dander, dust mites and mold spores are common allergens. One of the most familiar forms of allergy is allergic rhinitis, or hay fever. 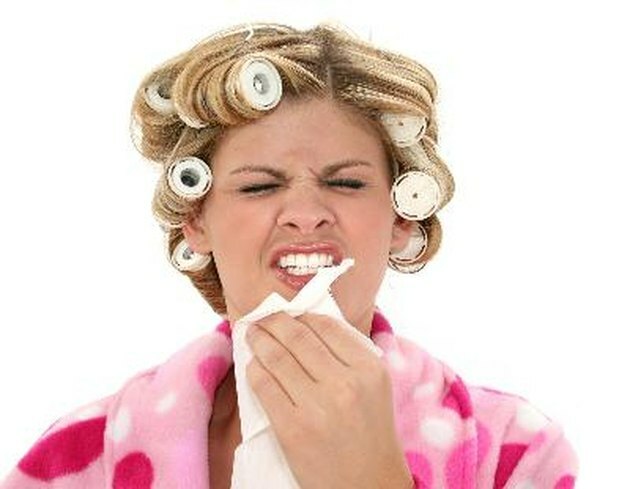 Sneezing, runny nose, sinus congestion and itchy eyes and throat are typical symptoms of hay fever. Medications designed to treat allergies often cause side effects, such as drowsiness, headache or dry mucous membranes, so many allergy sufferers opt for alternative remedies, such as zinc. Zinc is a metallic element that is considered an essential trace mineral in human nutrition. Zinc participates in a multitude of body processes, including immune function. "The Merck Manual of Diagnosis and Therapy" reports that zinc deficiency in children or adults contributes to impaired immunity, and asthma, which is frequently linked to allergies, is more prevalent among children of zinc-deficient mothers. Mirroring the results of several other investigations, a 1997 study in "Thorax" demonstrated that low dietary intake of zinc was linked to a significantly higher risk for allergies. In March 2011, experts at the University of Edinburgh Medical School analyzed 62 epidemiologic studies and concluded that deficiencies of several nutrients, including zinc, were associated with a higher incidence of allergy and asthma. However, none of the studies was randomized or blinded, so the review's authors conceded there was at least a moderate risk of bias in their analysis. Zinc is found in relative abundance in most animal foods, including red meat, poultry and liver. Whole grains, pecans, Brazil nuts, pumpkin seeds and ginger root are good plant sources, but some of the zinc in these foods is bound by fiber and phytates. Cooking or canning removes some zinc from foods, because it is relatively soluble in water. Zinc supplements are also commercially available. The evidence of benefit from using zinc for allergy prevention or treatment is mainly based on epidemiologic evidence. Few well-controlled, randomized, blinded trials have been conducted to evaluate the relationship between zinc and allergies. However, zinc deficiency does appear to increase your risk for allergies. Daily requirements for zinc vary from 2 mg to 14 mg, depending on your age and gender. Haas recommends up to 150 mg of elemental zinc daily -- a 220 mg tablet of zinc sulfate provides 55 mg of the elemental mineral -- for conditions requiring supplementation. Zinc is best taken on an empty stomach to reduce competition with other nutrients, such as copper.